Most standard orders placed before 12:01 PM Eastern Time will be processed when available and shipped next business day unless you choose option for expedited processing . In that case order will be shipped same day if placed before 4:00 pm ETZ . Please refer to Transit Map below for time frame delivery . 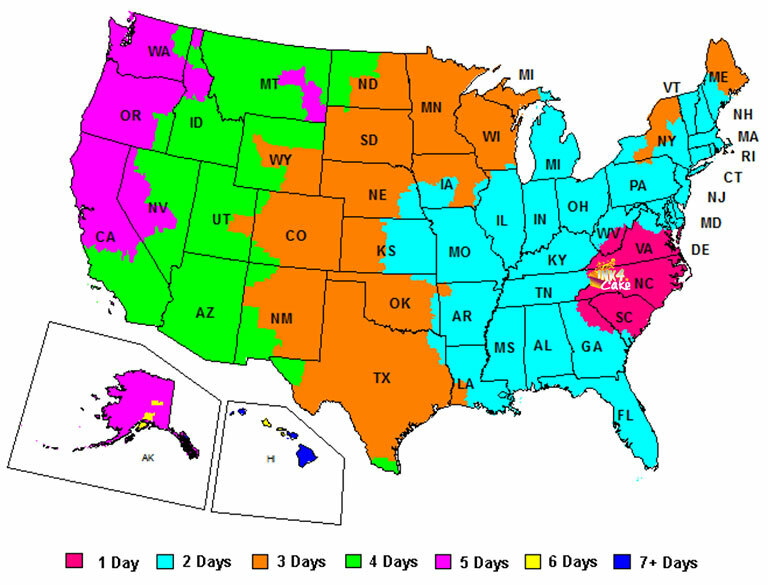 *This map illustrates service schedules in business days as of March, 2018 for Ground shipments. Overnight orders placed before 11:59 am Eastern Time will be shipped same day. Orders received before 11:59 AM Eastern time will ship the same day, provided the product ordered is in stock. If Overnight order is placed after that time please call us toll free at 855-Ink4Cake to check if we can accommodate your order. Express Cut off time is 3:30 pm Eastern Time for guaranteed delivery. Overnight orders placed on Friday will be delivered *next business day .For Saturday delivery you must call us and request quote for Saturday delivery. There is an charge extra fee for this service . Orders received after 11:59 AM will ship the next business day. Orders are not processed or shipped on Saturday or Sunday, except by prior arrangement. **NEW** Saturday delivery is available! Overnight orders placed on Friday will ship with FedEx Express to receive the item(s) on Saturday with an additional fee charged. Must contact us to CONFIRM Saturday delivery. Otherwise package will presume to arrive at destination for the next business day. Expect to pay double for this shipping option. We cannot guarantee when an order will arrive. Consider any shipping or transit time offered to you by Ink 4 Cakes or other parties only as an estimate. We encourage you to order in a timely fashion to avoid delays caused by shipping or product availability. All products will be shipped within 24- 48 hours unless they are out of stock! Smaller packages will be shipped with USPS First Class or Priority Mail . 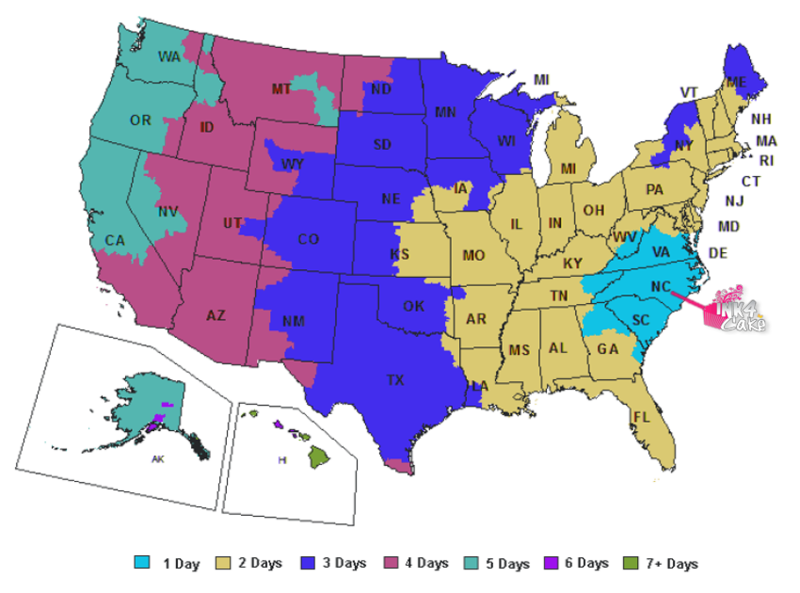 Please refer to USPS transit map and restrictions. International orders will be shipped USPS Priority Mail , First Class International or Priority Express per your request . Exact delivery time cannot be precisely given due to the Canadian Customs Duty. Your package may be withheld for various days. Please order in a timely fashion, so you allow enough time for these types of delays, which we unfortunately cannot control. For more info contact your country Customs . We deeply recommend Fedex International Air or DHL for urgent International orders. DHL will deliver package to any country in less than a week. Please note Fedex, UPS and USPS will not deliver on non business days, Weekends or Holidays.